Designed by local architects J. Woodman and R. M. Carey, the Paris Building was erected on behalf of the Paris Canadian Investment Company by Carter-Halls-Aldinger in two stages; the first five storeys were put up in 1915 and the upper six were added in 1917. Through the years, it housed a variety of businesses and organizations, including Dingwall’s Jewellers, Shea’s Custom Tailors, a modeling school, travel agency, architect, offices of the West Jewish News, and the Western Canada Insurance Underwriters’ Association. 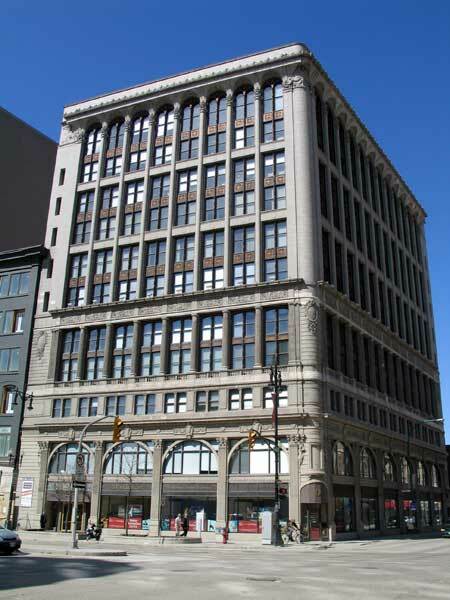 Aside from incidental renovations, the building has mostly retained its original appearance from 1915-17. The building, now a municipally-designated historic site, was recognized with Heritage Winnipeg Preservation Awards in 1988 and 2004. Paris Building (259 Portage Avenue), City of Winnipeg Historical Buildings Committee, October 1980.